always strikes me as uncommonly handsome. While I love the gymnasium skills of the rainbow, the brook trout always draws my eyes deep into its spots for an extended inspection. For the brookie, there is also a seemingly automatic, ritualistic inside whisper that preceeds her departure…”what a pretty fish”. Looks like a native fish and like the same fly I have been getting them on lately. Thanks for commenting. Having had a look at his nice fins…I thought he might be a native guy but wasn’t sure. Hey, are you finding fish hitting your stimulator fly on a dead drift under the surface as well as on top? 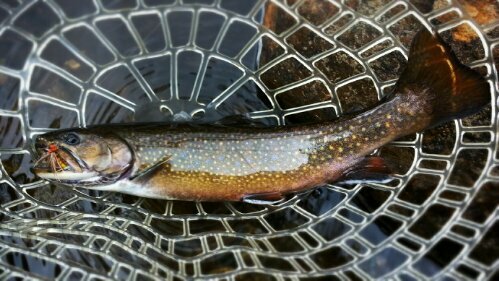 I got of my fish recently withbthe fly at least 2″ below the surface. Only on top in quieter water, but in faster currents both seem to get fish for me. They do seem a little fly size particular at times.